Only the second installment and I already changed the name (Thanks, Annie). Anyway, this is another one pitting two completely different movies against each other, but this is one that I have no idea who is going to win. I’d have probably had to tweak my system a bit if a movie nominated for 6 Oscars lost to a movie with a 32% on the Tomatometer Rating System last time. But not this battle. 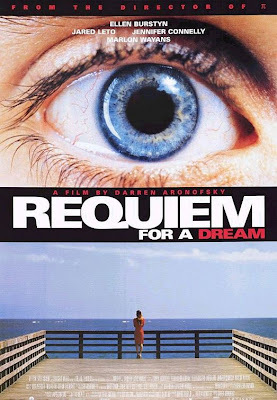 Requiem for a Dream is the final movie in my quest to see all the movies by Darren Aronofsky. Some were decent (Black Swan, Pi), one sucked (The Fountain) and this one was a really riveting peak into the lives of a couple drug addicts, shot in a way to take you with them on their journey. How To Train Your Dragon is a DreamWorks buddy film about Viking times where a clumsy, scrawny youth accidentally grounds a super-special dragon and they become friends. Believe it or not, these movies were written by completely different people. 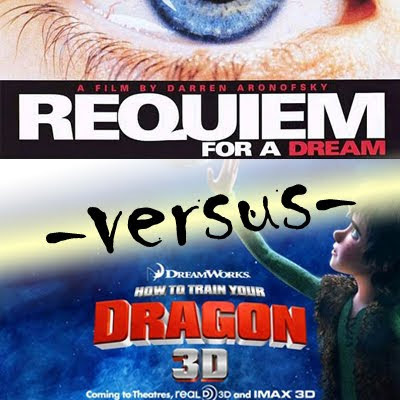 Overall: Well, I’d probably rate both of these movies pretty high on the bug rating, but the facts have played themselves out and made Requiem for a Dream the winner of this Double Feature Duel. Thanks for reading and I’ll probably have another title for this column next time.